Calera’s Central Coast wines are made from grapes grown by selected vineyards in California’s Central Coast Viticultural Area. 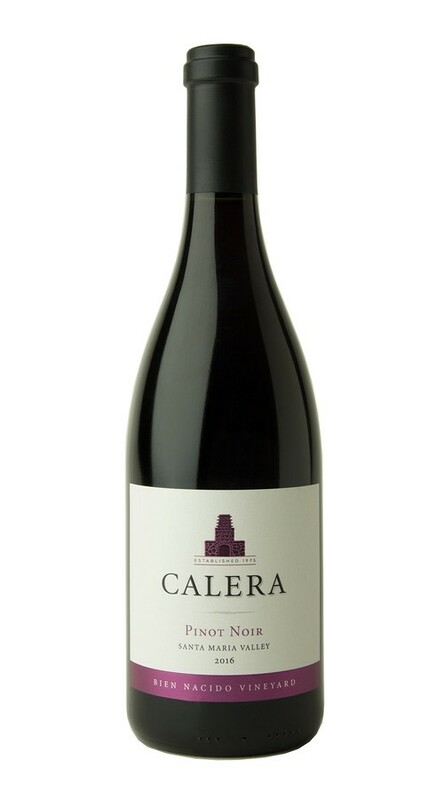 This wine was made as a barrel selection of Calera’s finest lots of Pinot Noir from the famed Bien Nacido Vineyard. The result is a dazzling Pinot Noir, with layers of black cherry, blackberry, anise and black pepper, as well as French oak-inspired hints of cedar and spice. Velvety tannins add to the rich, viscous mouthfeel, carrying the wine to a dramatic finish. After five years of drought, we welcomed a return to normal winter rainfall in 2016. These early season rains replenished the vineyards to begin a near-ideal growing season. After a warm spring led to an early budbreak, summer seemed to arrive quickly on the Central Coast. While we had abundant warmth in July and August, cool evenings allowed the grapes to mature perfectly, and harvest commenced in mid-August. While the grapes were small and dense, good-sized clusters delivered yields close to our annual averages. As a result, our 2016 Pinot Noirs are beautifully balanced, yet intense, while our Chardonnays are bright, crisp and flavorful.